Hogo makes it easy to protect and share your PDF, Word, Excel, and PowerPoint documents with just a few clicks. Most document security solutions only protect your data up to when the recipient receives it. Others only allow recipients to view files online. 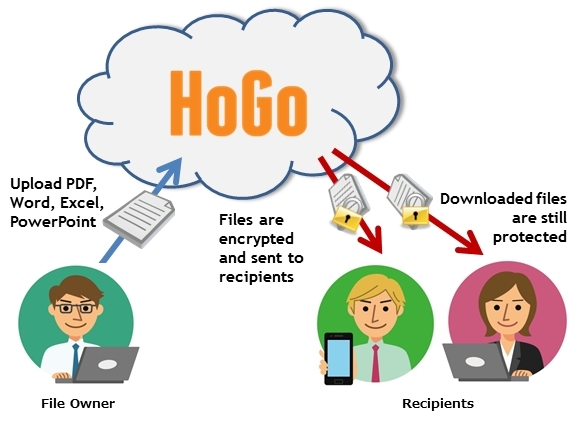 HoGo’s proprietary security platform continues to protect PDF, Word, Excel, and PowerPoint documents AFTER they have been downloaded by the intended recipient; preventing unauthorized sharing / forwarding, accidental leaks, and illegal copies. For Microsoft Office documents, HoGo provides fine grain control over copy and paste so that the contents of the files are protected while at the same time allowing for the use of the clipboard. Screen captures are also disabled when viewing or editing protected Microsoft Office files, and when viewing PDF documents in our free HoGo Viewer app. HoGo provides a wide range of options for sending your files to your intended recipients. You are in control over whether a file can be downloaded or not, how it is viewed, and what your recipient can do with the file. An Address Book that can be integrated with Gmail makes managing recipients easy. Keep track of who has your documents, who has opened them, how many times, when, and even where. Update permissions in real time. If a mobile device containing your document is stolen or lost, you can revoke access to your files at any time. Most document security solutions require the recipient to be online to view their documents. HoGo gives recipients the convenience and flexibility of working offline by downloading documents to their PC, Mac, or mobile device by installing the free HoGo Viewer. The HoGo Viewer is a free download for Windows, Mac, Android, and iOS (iPhone, iPad) that allows users to download, organize, and view protected documents. For instructions on how to uninstall HoGo Viewer, click here. For PC and Mac users, HoGo offers the option to view PDF files directly in Adobe Reader XI or Acrobat DC without any special software at all. Word, Excel, and PowerPoint files can be opened with Microsoft Office 2010, 2013, 2016 on Windows XP, Vista, Windows 7, Windows 8, and Windows10 by downloading and installing the free HoGo Add-in for Microsoft Office. Learn more about Hogo and all the feature details in our Features page or create your Hogo account now.